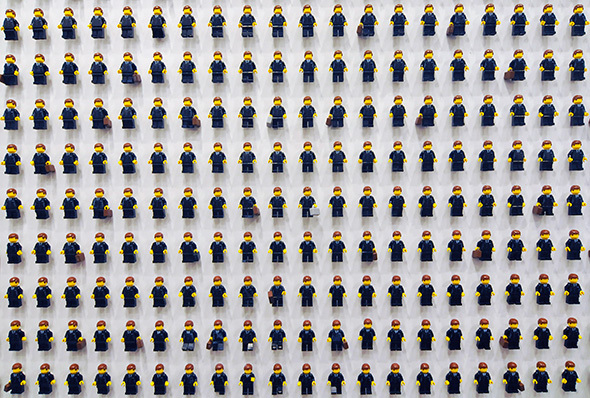 Art Toronto is back at the Metro Toronto Convention Centre. 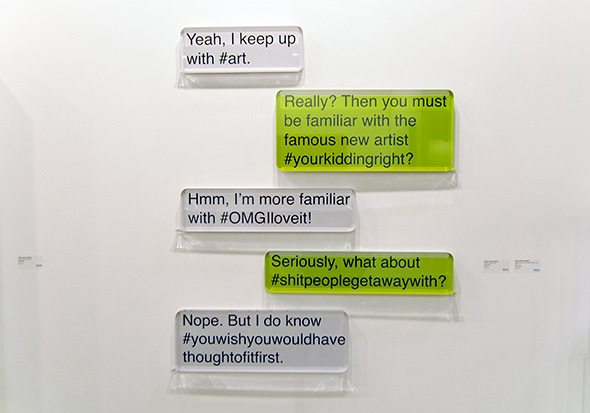 If you've never attended an art fair, this is the one to start with: Canada's only international art fair for modern and contemporary art is an overwhelming, full glitz ordeal with over 100 galleries participating, so there's little chance that you'll be bored walking down the aisles and bumping shoulders with art's dapper riff raff. Whether you're pursuing inspiration or snark (I like to be versatile and go both ways) you'll find it at TIAF. Approximately 20,000 people are expected to attend this weekend, so read on to be ahead of the game. Then don't forget to stop by Montreal-based Feature Contemporary Art Fair at Joey & Toby Tanenbaum Opera Centre (or at least read our review here). Here are five reasons that Art Toronto is worth the ticket price for those who are, at least for now, content collecting stamps on their coffee cards. Blind date? Much postponed platonic bonding session? You learn a lot from taking in hundreds upon hundreds of art works (and price tags) with another human being. Much like the first time people go on vacation together, if you survive a large scale art fair and still want to breathe the same air, your relationship is solid. For those attending alone, TIAF's sprawling wonders offer a great chance to build an intellectual rapport with yourself. I know you two barely talk. Some people can drop six figures on art. There's no zoo for people like this, or at least not one that doesn't cost about that many figures to sign up for, so TIAF performs a double public service beyond dazzling the eyes of the masses with expensive visual stimulants from around the world. Tweet your #overheards from the fair at me this weekend, maybe I'll make a list. 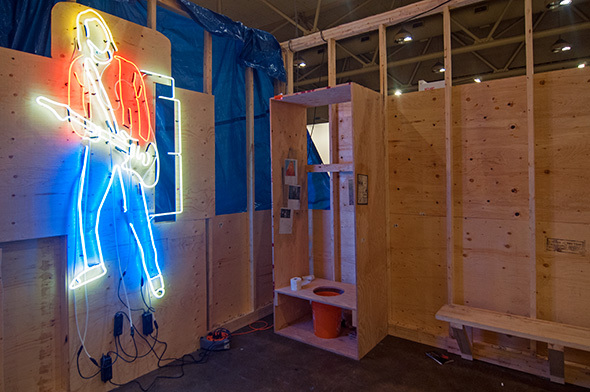 Tons of stuff at Art Toronto is terrible, but if it were all appalling I'd tell you to stay home re-watching election debates. There's great work no matter what your tastes and while it's on show to sell, you can catch glimpses of worlds where meaning exists beyond the listicle economy. Look for Ted Barker's breathtaking illustrative work at Actual, and for fans of smart pop Le Gallery stands out again. Anita Beckers (Frankfurt)'s delightful and messy set up of projections over comic inspired works by The Old Boys' Club made up one booth I kept coming back to. Toronto's visual arts and gallery scenes could stand a lot more bolstering, but we're doing alright, and that's clear at TIAF this year. 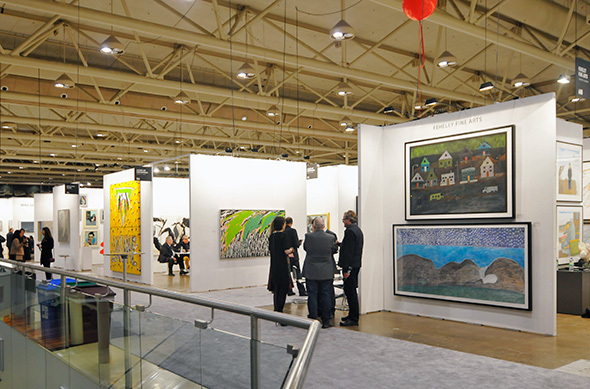 Almost every Toronto gallery of interest is set up (aside from a few notables who chose not to show at local fairs), and from painters to photographers to new media, artists including Edward Burtynsky, Annie MacDonell, Xiaojing Yan, Sarah Farndon (Rob is terrifying), Scott Waters, Jeremy Bailey, Jen Mann, and Xiao Guo Hui should make even the most cynical local proud. 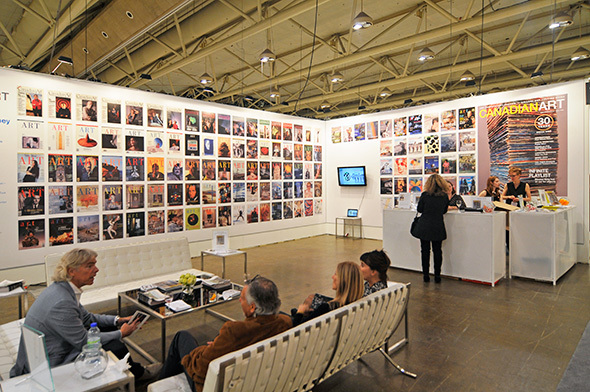 Art Toronto is on until Monday, Oct 27 at Metro Toronto Convention Centre, North Building, Exhibit Hall A & B, 255 Front Street West. Adult admission is $18. Find hours and more info here. 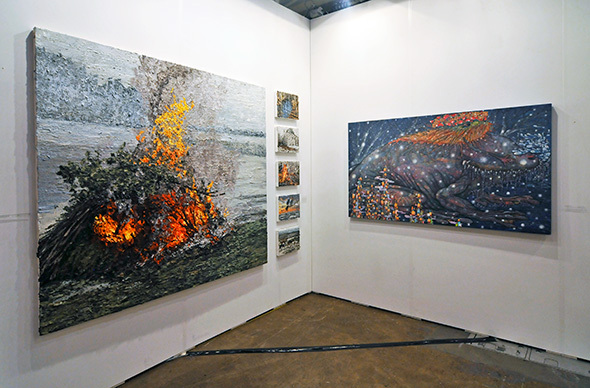 You can find most of the art works on TIAF's Artsy.net page - including works under $1000. An earlier version of this article sited Tasman Richardson's work, which appears to be an error. I just got excited. Aubrey Jax is sharing the weird things you say to her in the bathroom on Twitter.